For Mr. P and I, we decided early on that the only popcorn in our house would be for movie night. If you have ever taken down a popcorn ceiling then you know what a large task this is. If you haven’t and you are wanting to take on this project in your own home, read below as we go through step by step on how to take down popcorn ceilings. Keep in mind before beginning this project, that it is very messy! Since we knew at closing that we were going to do tackle this, it was placed as project #1 from the start. Luckily, by having another place to live, we were able to do it without having to move or cover furniture. This is highly recommended. Once you have decided on your plan of attack, we are ready to begin. Step 1: Remove all pictures, furniture, and decor from the room. Step 2: Prep the room surfaces with plastic sheeting. Lay the plastic over the entire floor surface (assuming you are keeping the floors) making sure to go at least one foot up the wall. Leave enough slack so that the step-ladder can be moved around without pulling the plastic up. Tape the plastic to the wall with plenty of masking tape. The goal is that no water will get on the floor underneath. If more than one row of plastic is needed to cover the floor, overlap the sheeting and tape with duct tape. If there is furniture in the room that cannot be moved, cover each piece completely with the plastic, taping it down as needed. *STP Tip: The vast amount of water needed to saturate the ceiling will cause some of the wall paint to start coming off. 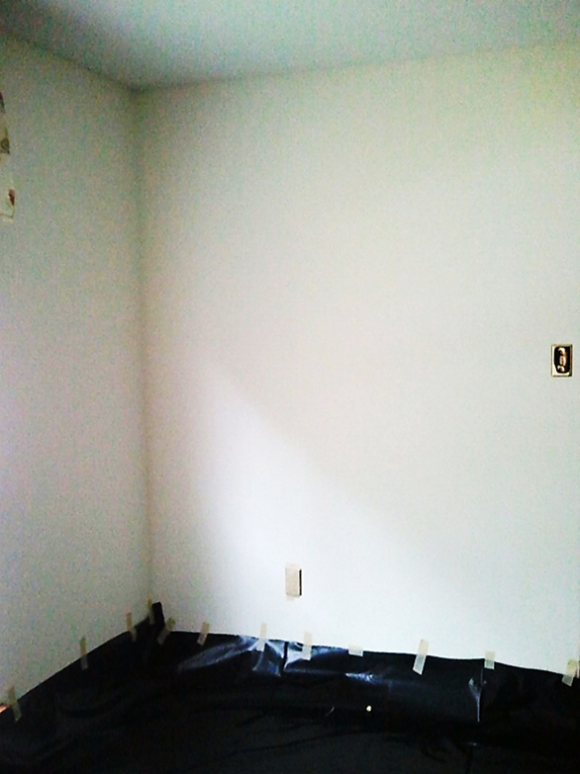 If you are not planning on repainting the walls, plastic sheeting will need to be hung from the floor to the ceiling. 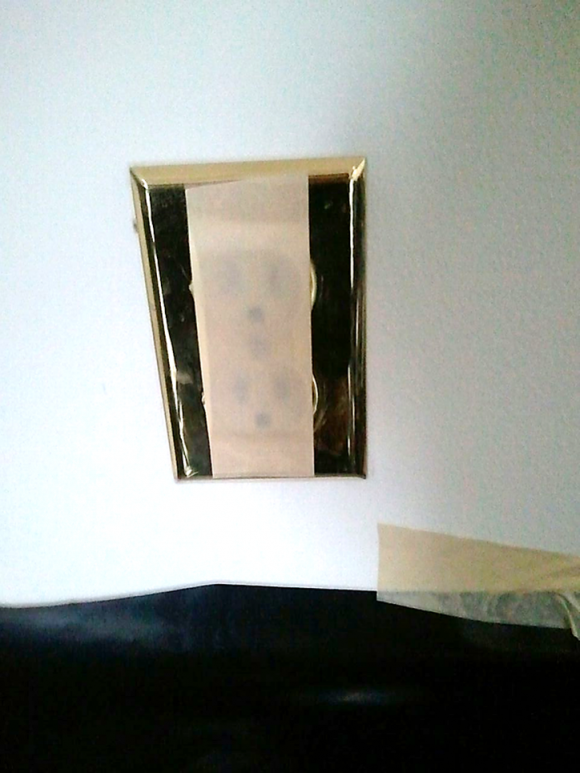 Step 3 – Cover all sockets, outlets, or other electrical areas with masking tape. Step 4 – Remove all light fixtures. Once removed, tape up any exposed area. The prep time per room ranged from 20 to 40 minutes, depending on the size of the room and the number of fixtures that needed to be removed. Good prep work in the beginning will save you additional cleanup in the end. Step 5 – Spray the entire ceiling thoroughly with water. Once everything that you would like to keep dry is covered with plastic sheeting, it is time to put on your rain jacket and start spraying. 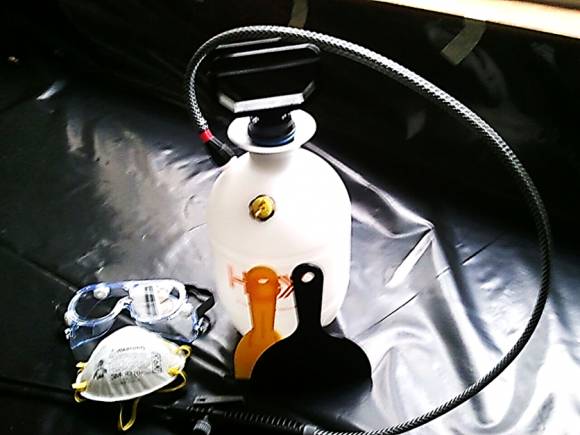 Fill the garden sprayer with water and pump until the container is pressurized. Starting in one of the corner’s of the room, liberally spray the water across the entire ceiling surface. Let the water absorb for at least 10 minutes. In a test spot, take the scraper and scrape a small section of the ceiling. If the popcorn surface comes off easily, continue to Step 6. If the popcorn ceiling continues to stick, respray the ceiling with water, wait 10 more minutes, and try scraping again. Step 6: Scrape the popcorn ceilings. Now, the fun part. Using the plastic scraper (stay away from the metal kind or the chances of chipping the ceiling are increased), begin scraping off the popcorn ceiling. The popcorn ceiling layer should come off relatively easy in most spots. 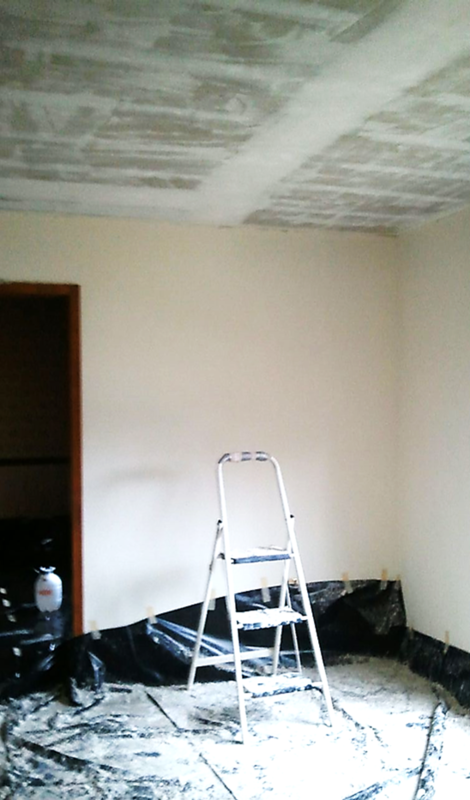 Continue scraping until all of the popcorn ceiling surface is removed. And…voila! Our freshly scraped popcorn ceilings! 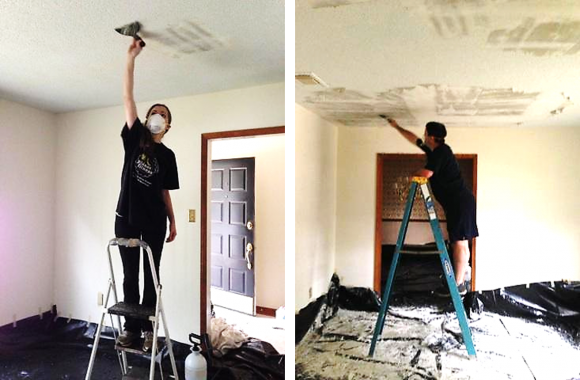 Check back for our next project – prepping and painting the ceiling. Have you taken down popcorn ceilings in your home? Tell us about it!